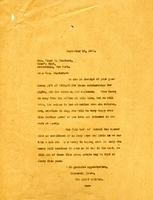 Letter from Martha Berry to Mrs. John Henry Hammond in appreciation of her telegram at commencement. Miss Berry also mentions her recovery, delays in being able to construct a dormitory, and resignation of Mr. Frank R. Chambers as trustee. 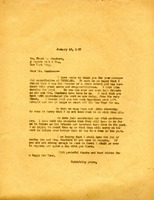 The Berry Schools writes Mrs. Frank R. Chambers to thank her for her generous donation of $500 for three scholarships, clothing, and expenses. 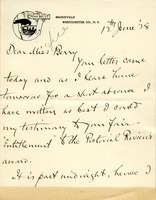 Frank R. Chambers tells Miss Berry that he did his best to write her a recommendation for the Pictorial Review award. Miss Berry thanks Mr. 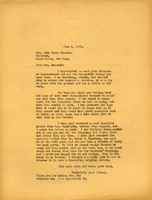 Chambers for his donation to the Berry Schools. Miss Berry would like to Mr. and Mrs. Chambers to visit the schools.